Mohafiz Security Vehicle is another proud product of HIT which has welded Alumiuium Armour hull with ricochet angles all round. The hull is protected against 7.62mm bullet point blank range. The vehicle has bullet proof wind screen and run flat tyres. It can accommodate 8 persons with 10 firing ports. This vehicle is based on the chassis of a proven Land Rover commercial vehicle, for ease of maintenance support. The hull of this vehicle has been fabricated using welded Aluminum Armor. It has bullet proof wind screens and run flat tyres. Seating capacity is 8 persons with 10 firing ports towards the rear and on both sides. 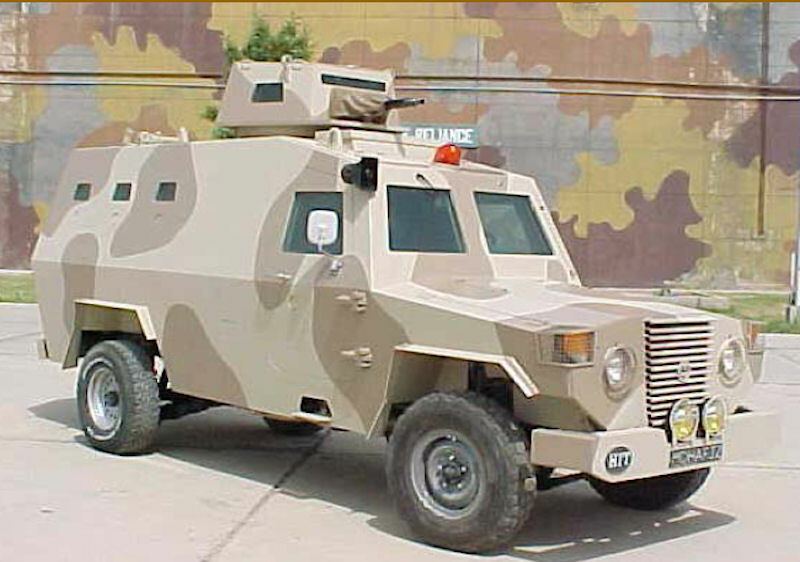 Early in 2000, the Heavy Industries Taxila (HIT) started design work on a new 4 × 4 Internal Security (IS) vehicle called the Mohafiz. This was first shown in mid-November 2000 and in December 2000 started extensive trials. Possible customers for this vehicle are the Pakistani Rangers and Police. Some interest was shown by banks, which would use the Mohafiz to transport bullion and cash. 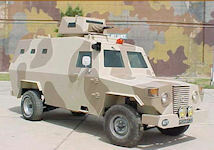 The first export customer for the Mohafiz was Iraq, which took delivery of 60 vehicles in 2006. These are based on a Land Rover 110 (4 × 4) chassis. The Mohafiz APC has an all-welded aluminium armor body that provides the occupants with protection from small arms fire up to 7.62 mm in calibre and shell splinters. The fully enclosed engine compartment is at the front with the crew compartment extending to the rear.The commander and driver are seated at the front and provided with bulletproof windows to their front and a forward opening door with a bulletproof window in the upper part either side. These bulletproof windows are covered by wire mesh screens. The bulletproof windows provide the same level of protection as the armored hull. The troop compartment is at the rear with the troops seated either side on bench seats and enter the vehicle via a large door in the rear opening to the right. Bulletproof windows are provided in the sides and rear of the troop compartment. A total of 10 firing ports are provided to allow rifles and other small arms to be used from within the vehicle. The upper parts of the hull slope slightly inwards as does the hull rear.Mounted on the forward part of the roof is a manually-operated one-person turret armed with a 7.62 mm machine gun and/or a tear gas grenade launcher and a two-part roof hatch which opens left and right. Vehicles delivered to Iraq are fitted with a one-person turret armed with a 7.62 mm PK machine gun.To the immediate rear of the turret are two forward-opening roof hatches although the design of the vehicle is flexible. The Defender was the ideal choice on which to base the vehicle, its base being the most suitable for handling the added weight of the new aluminium armored body. The armour, in its basic form, is capable of withstanding fire from 7.62mm ball ammunition, as is the glass. The small turret can be fitted with a range of weapons. Lethal or non-lethal, depending on customer requirements, but it is normally fitted with either a 7.62mm or even a 12.7mm machine gun. Although the weight has been increased to 3,500kg because of the added armor and other such modifications, the water-cooled turbodiesel (111hp at 4,000rpm), and power-steering still allow for reasonable performance under the circumstances. Cross Drive Torque converter planetary all torque shifting. Ccross Drive Torque converter planetary all torque shifting.